Is it possible to remove worn carpeting, ceramic tile or sheet vinyl from an existing concrete subfloor and then stain or polish it? You bet. And in some cases, it’s even possible to go right over the existing floor covering with a decorative concrete overlay or microtopping. Many cement-based overlays can be placed over vinyl flooring, tile or wood if the surface is prepared properly. If you decide to make the switch to decorative concrete floors, be advised that the job can be a big undertaking. Some of the challenges include ripping up and disposing of the old flooring and removing any adhesives used to glue it down. Once the carpeting or tile is removed, you may also find tack-strip holes or cracks in the existing floor that will need patching. If you cover the floor with an overlay, this will add to the height of the floor and may require special adjustments at baseboards and transitions. Watch these videos to learn more about what’s involved in making the switch to decorative concrete floors. 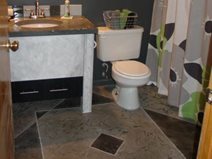 An old linoleum bathroom floor is updated with a concrete overlay scored and stained to look like stone tile. Colors on Concrete in Upland, Calif.
An integrally colored microtopping, troweled smooth and sealed with a urethane, was the solution to replicating the look of a polished concrete floor. 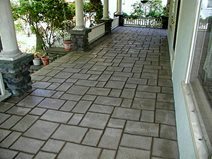 Contractor develops a process to cover old wood floors and decks with decorative stamped concrete. 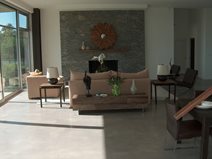 Concrete floor video showing how you can install colorful and durable.